Right Rev. Dr. J. Coote-Duggan, Lord Bishop of Tuam and Most Rev. 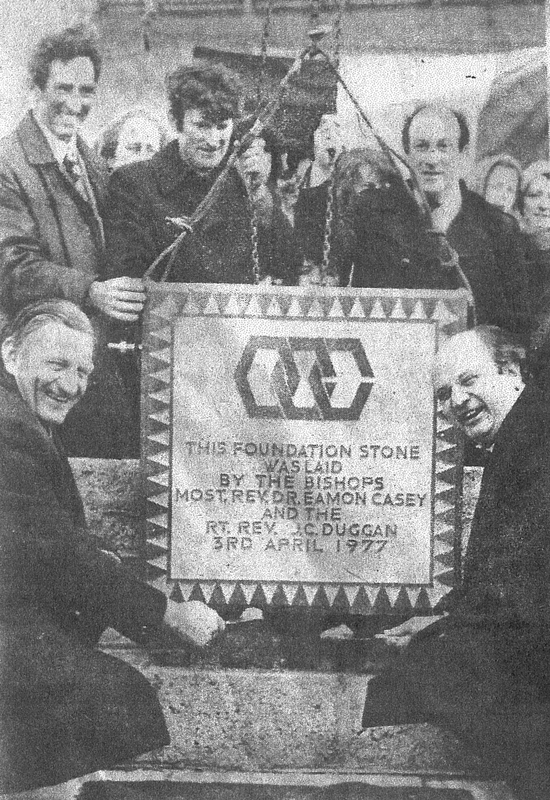 Dr. Eamon Casey, Bishop of Galway lay the foundation stone for the new Community Centre in Oughterard. Also in the picture are Mr. Stephen Tierney, Mr Seamus O'Malley and Mr. Malcolm Alexander, chairman of the Committee. 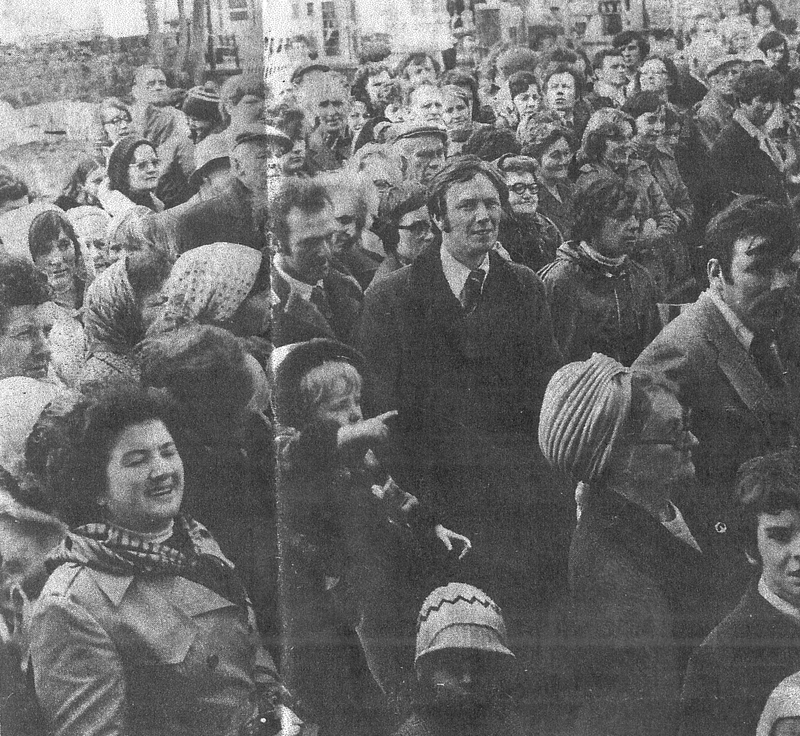 A section of the crowd who attended the laying of the foundation stone for the new Community Centre by Most Rev. Dr. Casey and Right Rev. Dr. J. Coote-Duggan in Oughterard on Sunday. Oughterard Community Centre Building Committee saw the first step being taken on the road to the completion of their task on Sunday when the community centre foundation stone was laid. Oughterard has long felt the need of a modern Community Centre, and the laying of the Foundation Stone is a landmark in the annals of the parish as a statement from the promoters points out. The Stone, with its inscription is a donation to the project was laid by Most Rev. Dr. Eamonn Casey, Bishop of Galway and Right Rev. J. C. Duggan, Bishop of Tuam, Killala and Achonry. For many years the needs of Oughterard were served by an ancient structure known as the ‘Kirk’ and the crisis came when this building was totally destroyed in the big storm of January ’74. 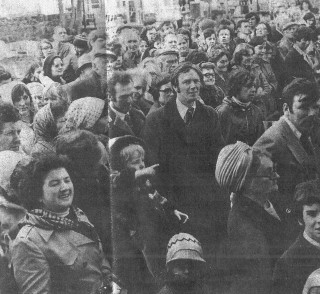 It was decided to replace it by a Hall which would cater for the needs of the whole Community. A Building Committee was elected and all parish organisations were invited to name the facilities which they would wish to see included in the new Centre. It was the duty of the Committee to correlate these wishes and get a plan prepared which would incorporate them all as far as practically possible. The result is the building which is now starting to take shape. The prefabricated shell, measuring 138’ x 53’ has been erected by an outside firm, but for the rest of the work every possible use will be made of local resources, so that money subscribed by the parish will be kept within the parish. The Contractor, his employees and the manufacturer of the building blocks are all parishioners and it is hoped that as work proceeds, there will be opportunities for the employment of many more local people. The internal layout will include a large hall, with facilities for dancing, basketball, badminton and boxing, a stage, meeting rooms, changing rooms, showers and a kitchen. It is estimated that the completed building will cost in the region of £65,000 and to date over £15,000 has been collected. The project is a great venture of faith and in these times of inflation the prospect is sometimes daunting, but the committee is encouraged by the conviction that the Centre will confer a lasting benefit on the present community and on the young generation now starting to grow up. This page was added on 11/09/2012.